I was so looking forward to registering my special occasion and owning my very own day. It would have been cool to have gotten the day registered for baby Harold, after all this is a celebration for him. However, with 10 older children we didn't want any jealousy. So we opted for registering a very special day in our lives, our wedding day. It's a very simple process. 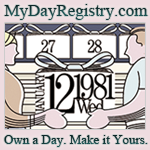 You go to the My Day Registry site and enter your date to see if it is available. The next screen will appear, showing you which registries your date is available in. You then choose state, country or worldwide. You then enter your special event (this is where I put "Harold and Karen's Wedding Day"). You can then choose from 3 frames (or choose no frame and save $10). Lastly you fill in some account information and shipping information. And then you wait patiently for your certificate to arrive announcing you (or someone special) as the proud owner of a day in history. While you wait for your certificate you can take the time to personalize your online profile. Again, a simple process. This page has the date registered, who owns it, who purchased it and why the day is important. You also get to upload several pictures for a slideshow and a video. My pictures uploaded with no problem, though I do wish we could load more pictures (what can a say, I am picture obsessed). Unfortunately the video I would like to upload was too tricky for me to do. That is because I am pathetic when it comes to computers, not the fault of the sight. All you need to do is upload the video from YouTube. Problem is, my video is still on the DVD, it is the slide show set to our song that we shared during our wedding ceremony. That's okay, I'll get it eventually. Now, back to the certificate. It arrived promptly and in perfect condition, as it was very carefully packaged. After opening it, the first thing hubby noticed was that it was a quality frame. We chose the Black Step Frame. Hubby seemed very happy with the certificate, which is very important as it represents our special day. I have to say, even though I also enjoy it, I do think it is a bit cluttered in the picture, making it hard to focus on our day. But that is just my thought, as I said, hubby is quite happy with it. So, we are now the proud owners of a day in history. Obviously this is a novelty item, but it is so cool to think we own a day. How would you like to own your very own day? Or, do you have someone special in your life that you would like to register a day for on their special occasion? (Graduation and father's day is coming up. I think 1st Father's Day would be a sweet occasion to register.) My Day Registry is allowing me to give away, not 1, but 4 days. Two winners will receive framed certificates in their choice of registry. Two other winners will receive unframed certificates in their choice of registry. This giveaway is open worldwide. However, international winners will automatically receive an unframed certificate. The giveaway runs from 12:01am May 28th - 11:59pm May 9th. Disclosure: I was able to register a day in the United States registry from mydayregistry.com and receive a beautiful framed certificate for free as a part of my Baby Shower Celebration. This did not in any way influence my review. I only recommend products I use personally and will be good for my readers. This would be something really neat to win. I love how it is on parchment in modern calligraphy!